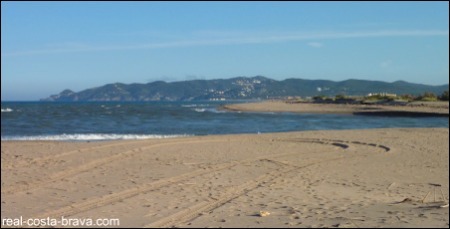 The conservation area of Aiguamolls de Baix Emporda, also known as Basses d’en Coll, is located on the delta of the River D’Aro and River Ter, behind Pals beach. It is a smaller scale version of the wetlands of Parc Natural dels Aiguamolls de l’Emporda. 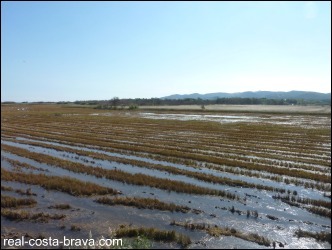 The wetlands of Basses d’en Coll were created by the freshwater runoff from rice fields that have been cultivated in the Baix Emporda since the 15 century. 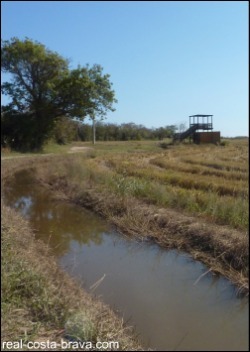 Rice is still grown in the marshes and meadows behind Pals beach today, but no need to worry about mosquitos, well, anymore than usual (the water is drained off through irrigation channels rather than being allowed to stagnate). Aiguamolls, a haven for aquatic creatures and birds, is a protected area that is concerned with conserving the dunes, lagoons and reed beds of the wetlands along side the rice cultivation of the area. 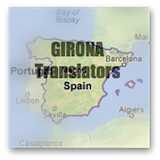 There is a lovely gentle walk around this Costa Brava wetland area on one of the many National trails that criss cross the Costa Brava. The trail that passes through Aiguamolls is the PR-C 109, clearly marked with a yellow and white stripe. Starting from the information booth in the car park, the path eventually reaches a T-junction at the river, where you take a right and walk towards Pals beach. There is a hide/observation tower, soon after you turn right at the T-junction ,where you can spy on the wildlife and get a great view of the Baix Emporda. What nature might you find in the wetlands? There is an information booth and map/information boards in the car park, an observation tower and paths. after approximately 1 km you will see the car park for Basses d’en Coll on your left. You can take public transport to Pals and then walk.